For the potatoes, put them in saucepan with plenty of cold water then bring to the boil, then turn down to a gentle boil for around 20 minutes, maybe a bit more if you are using large potatoes. Pick one up with a spoon from the water and see if you can easily put a fork in it, when you can they are ready. For the pumpkin, put pumpkin in another large saucepan with boiling, salted water for 10 minutes or until tender. Drain. Return to pumpkin to pan, mash until almost smooth. Add milk, cheese and butter. Season with salt a bit as cheese may be salty and pepper. Stir to combine. For the carrots, just drop these into boiling waterwith potatoes and they will only need about 10 minutes. I think they are best when they still have a bit of bite, but that’s just a matter of taste. Try one after 8 minutes and see if they are ok for you, you may want to leave them for up to 12 minutes or so, but the more you cook them, the more vitamins you lose! 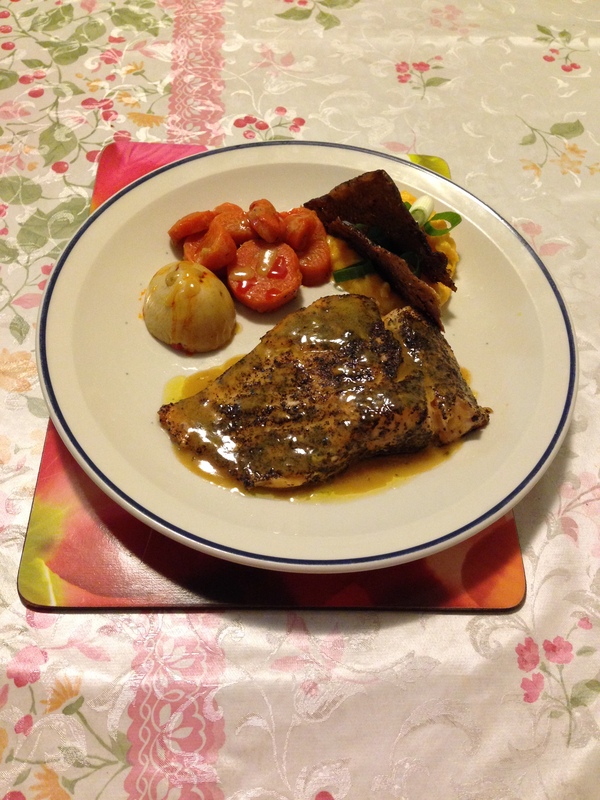 Place the salmon onto a plate, open the green tea bags and shake the green tea over the salmon. Season with salt and pepper and make sure the salmon is evenly coated on all sides. Pour a small amount of olive oil into a frying pan over a medium heat and place the salmon in the pan, skin side down. Fry the skin side for at least four minutes then occasionally turn the salmon until it is golden brown on the other sides. Remove the cooked salmon from the frying pan and peel off the skins by sliding a knife under them. Place the skins back into the pan, soft side down, and cook for a minute to crisp them up. To make lemon butter, bring a large saucepan of water to boil over a medium-high heat. Reduce heat to low. Whisk eggs, sugar, lemon juice and lemon zest in a medium stainless steel bowl to blend. Place bowl over hot water and whisk in butter. Continue to whisk for a further 3 minutes, or until lemon butter has become thick and creamy and coats the back of a spoon. Remove from heat and whisk until most of the heat from the lemon butter scatters. Add in oil stirring occasionally. To plate, put salmon on one side, opposite salmon put the carrots and potato. Then the mashed pumpkin in between the vegetables and salmon. place the crispy skin on the edge of the mashed pumpkin. Pour 1-2 Tbsp lemon butter over salmon and place a dollop or two on the vegetables. Use barramundi and filo pastry instead of potatoes. Made by Helen. Pre-heated 200C. Thaw the barramundi. Add olive oil to hot pan.Saute onions, garlic and leek.Season with a little salt. Add kale, spring onion and thyme to the pan and season with pepper. Cook kale until tender soft about 10 mins. Then add barramundi cook for a few minutes. Lightly beat the eggs in a bowl, add the cream and whisk together.Add the mixture from the pan into the bowl and mix together. Transfer cooked ingredients into the grease baking dish and lined with filo pastry. Place in oven 25-35 minutes until filo is lightly brown. Season salmon fillet with salt, and cinnamon. 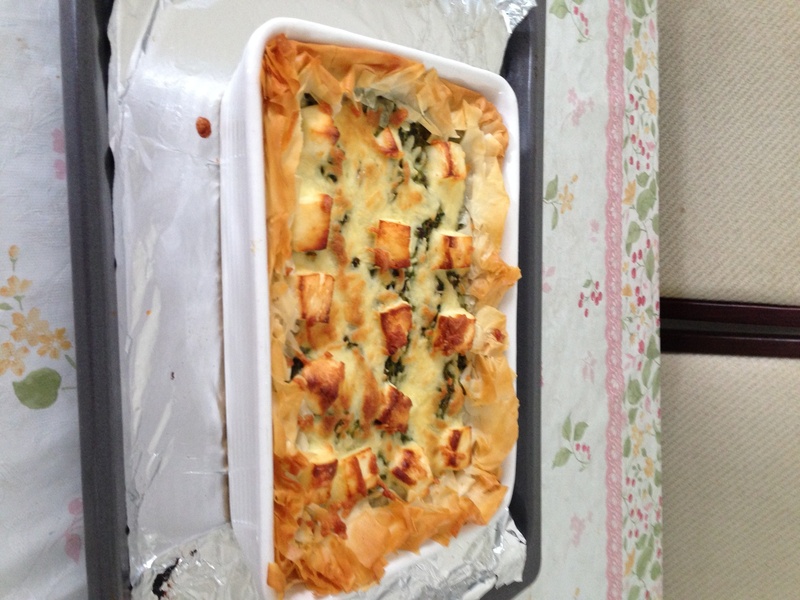 Divide 1/2 the spinach between 2 sheets of puff pastry and mound in the center. 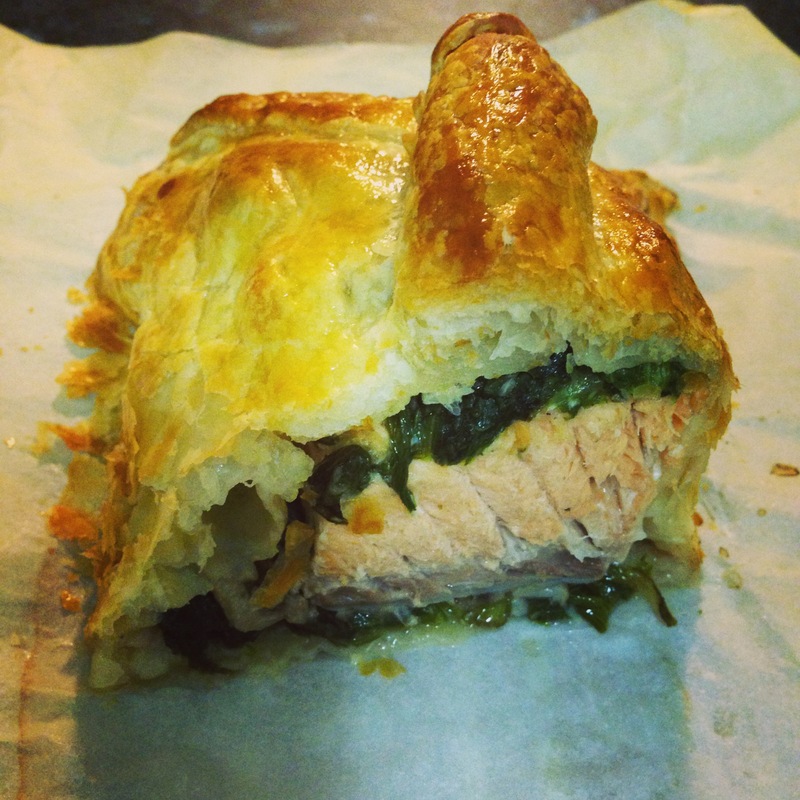 Place salmon on top of spinach. Spoon burgundy over salmon and top with remaining spinach. Moisten edges of puff pastry with an egg lightly beaten, fold to center and seal the seams. Bake for 30-35 minutes until the pastry is puffed and golden.